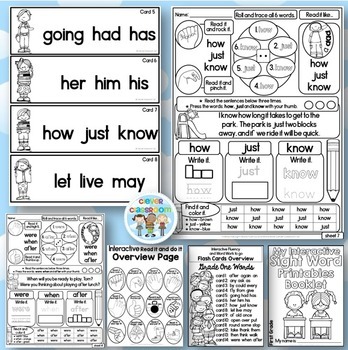 This pack has everything you need to help students learn and practice their sight words. The pages are interactive, providing a different, and fun way for students to read and work with their Dolch words. Please download the preview file to grab TWO PAGES FOR FREE. The activities are suitable for centers, morning work, guided reading groups, Daily 5. Children interact with the pages in a hands-on fun way! This file is another in our range of interactive files. ★ How to pages, step by step. ★ First Grade word list. ★ Read it and do it page (hand actions to do while reading a word) overview page. ★ Fluency flash cards (3 to a card). Provided in both color and black and white. ★ Fluency tracking sheet for teachers. ★ Fluency tracking sheet for students. 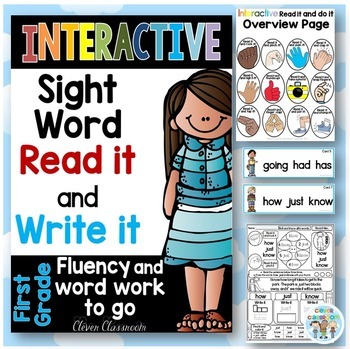 ★ Interactive Sight Word Printable student booklet cover. ★ 14 x printables with three focus words to a page. 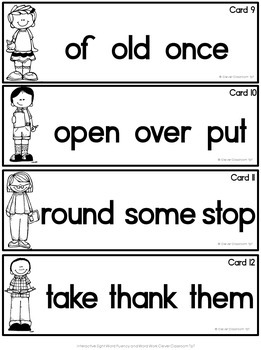 Students work through the printable starting at practicing the word by completing the action and then reading it in the voice seen on the page. Children then move on to reading then writing the word. Lastly, they read the sentences then trace the final sentence. ~ Please see the PREVIEW file for an ever closer look at the pages. You will find two FREE pages within the preview. This file can also be found in our HUGE Sight Word NEVER ENDING BUNDLE This MASSIVE file is a growing bundle and includes all of our sight word sets. Any new files added, means you get them for free.